When a public figure reveals a health diagnosis, it is often accompanied by a message of hope and determination. Last year, pancreatic cancer was the third-leading cause of death from cancer in the United States, according to the National Cancer Institute (NCI). Two-thirds of cases are inoperable upon diagnosis. With all that in mind, it’s no surprise when a stage IV pancreatic cancer diagnosis is shared, a hush seems to come over the room. However even if Khalil and his team identify it early, pancreatic cancer is still problematic. “Stage for stage, pancreatic cancer is associated with lower survival rates of any major cancer like breast and colon,” he says. Pancreatic cancer is resistant to many of the available therapies due to something called signaling redundancy – “single targeted agent is less likely to be effective,” Khalil says. The tumor is often surrounded by connective tissue, which makes it difficult for treatment to reach its target, once a tumor is established. Khalil sees pancreatic cancer in more men than women and usually in older patients, between the ages of 65 and 80. About 30 percent of patients are smokers, and 5 percent have a history of pancreatitis, an inflammation of the pancreas, which can be caused by stones or heavy alcohol intake. Three to four percent of pancreatic cancers are due to inherited gene alteration, like BRCA 1 and BRCA2 genes. These genes can increase the risk for breast, ovary, prostate and bladder cancers. Diets high in fat and processed meat, obesity, a history of diabetes, and exposure to industrial carcinogens also may increase your risk. Within the last two decades, chemotherapy treatment options have expanded from one single drug to a menu of options that offer patients more life, more care, more hope. Lehigh Valley Cancer Institute offers cancer patients private consultation meetings with cancer specialists through multidisciplinary clinics (MDC). For pancreatic cancer patients, the gastrointestinal cancer MDC brings together specialists from surgical oncology, radiation oncology, medical oncology, nursing, radiology, pathology clinical trials, nutrition and social services. This collaborative, interdisciplinary group explains the patient’s diagnosis and offers recommendations for treatment. As part of the MDC meeting, the patient and his or her loved ones are encouraged to ask questions. A nurse navigator also attends the MDC and coordinates care for the patient afterward. There is so much new pancreatic cancer research happening at this very moment including new chemotherapy drugs, targeted therapies, immunotherapy, and drug combinations. Patients at the Cancer Institute can participate in clinical trials through NCI Community Oncology Research Program (NCORP), as well as clinical trials available at Memorial Sloan Kettering through the Memorial Sloan Kettering Cancer Alliance. We also have many other pharma and investigator initiated trials, as well. 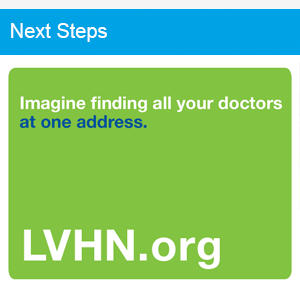 To learn more about our Lehigh Valley Cancer Institute, options for care, and the dedicated people who provide that care, visit LVHN.org/cancerinstitute or call 888-402-LVHN (5846).